Queen’s MA graduate Aidan Fadden (who writes under the name Aidan Conway), has signed a two book deal with Harper Collins ‘Killer Reads’, having just published his first novel – A Known Evil – which was launched at John Cabot University in Rome on 18 April 2018. 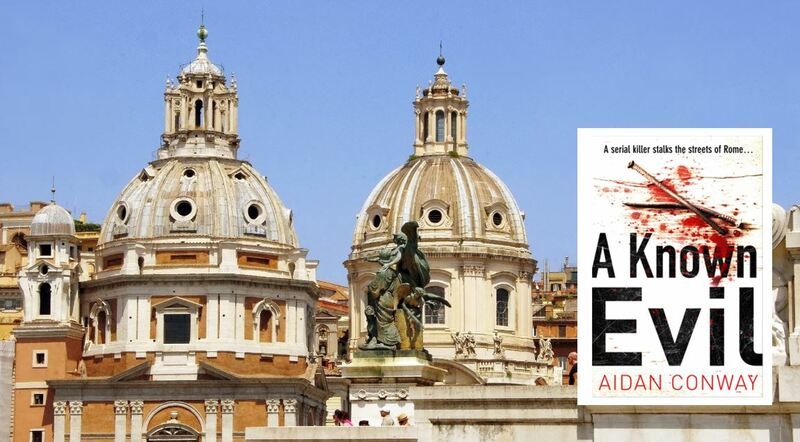 A literary crime-thriller set in contemporary Rome, the follow-up in the series – A Cold Flame – is set for release in July 2018. Aidan Conway graduated from Queen’s in 1998 with an MA in Modern Literary Studies and also holds a BA in English Literature from UCNW (University College of North Wales) now Bangor University. Born in Birmingham to Irish parents, Aidan has been living in Rome since 2001. He has been a bookseller, a proof-reader, a language consultant, as well as a freelance teacher, translator, and editor for the United Nations FAO. He is currently an assistant lecturer at John Cabot American University in Rome, where he lives with his family. Set in the depths of a freakish winter in Rome, A Known Evil introduces maverick Detective Inspectors Rossi and Carrara who are assigned to invest a serial killer dubbed The Carpenter who is intent on spreading fear and violence. In a city wracked by corruption and paranoia, the question is: how much is Rossi willing to sacrifice to get to the truth? Aidan began writing A Known Evil on ‘Blue Monday’ – the most depressing day of the year – in January 2014, on what was a totally new and uncharted adventure. Though a writer of one kind or another throughout his life – he had enjoyed a little success with poetry and short stories previously – he had never attempted to write a crime thriller. Having lived in Rome for over 10 years – and before that, briefly, in Sicily – Aidan was more than familiar with the architecture and intrigue of the Eternal City, with its museums, cobbled side-streets and cafes, warm summer evenings and cold white wine. He was also familiar with the dark side of the city – the politics and corruption that go hand-in-hand with bureaucracy, nepotism and blackmail. Speaking about how he got started Aidan said: “I realised I had plenty to write about. More than enough. In my work as a language consultant I had also had some access to the corridors of power, state bodies, and multinationals. “I got to sit down with CEOs, oil executives, undercover policemen, and maybe even some spies. You find people open up to you when you are an outsider and you are chatting one-to-one. Shortly after ‘Blue Monday’, Aidan got his ‘big idea’. “In a flash, an epiphany, I knew exactly how my book was going to end,” he said. “I scribbled it all down in a flurry and knew then I had nailed it. I just had to fill in the rest. “So what had started as a diversion quite quickly began to take on a solid form and I had to finish it. Published by Harper Collins, further details are available here.